We use it for the same thing you mention in your post. It took a bit of convincing with a pervious employer to send me off to get trained on Visio. He sure was happy he did though as our sales increased significantly when we included the drawings in our quotes and proposals. I am glad to hear that you are taking advantage of it's abilities. 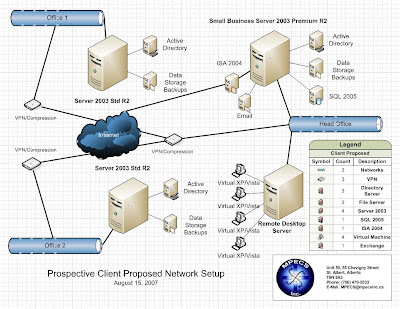 A few years back, we obtained a copy of the Microsoft Office Visio 2003 Resource Kit that contained a huge selection of NetZoom stencils and the very handy LANsurveyor to scope out a network setup directly into Visio. We have yet to test whether it will work with Visio 2007. We think it will, but we will see. I do hope that Microsoft puts together another offer like that for Visio 2007. It was well worth it.